So put yourself in this homeowner’s shoes. You have gutted your master bathroom with the intention of creating a European style oasis. Your search begins for the right look, color and design for your countertops, sinks and bath surround. As you exhaust yourself looking at granite and other natural stone you realize nothing is matching the look in your mind. Six months have passed and well, tensions are rising over getting this project finished. And that’s when they found the perfect medium to custom create the design in their minds. The solution was GFRC, glass fiber reinforced concrete. 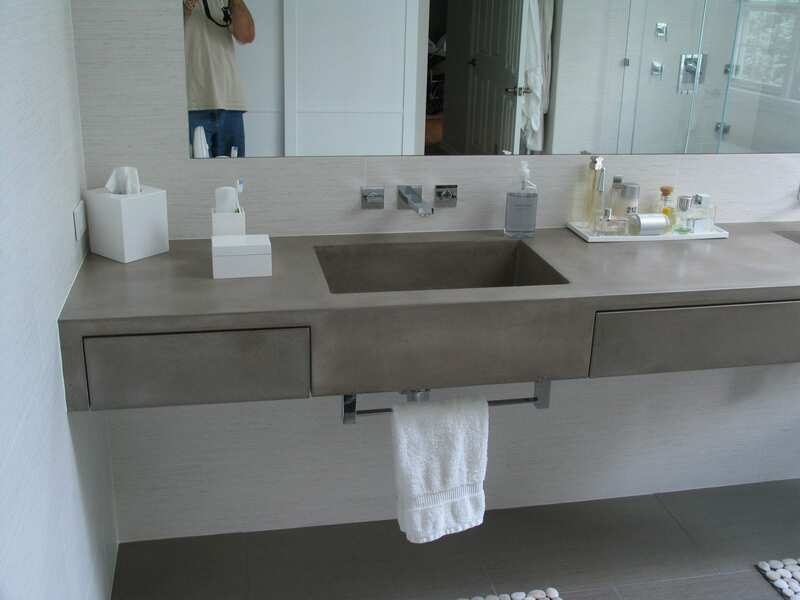 Immediately they fell in love with the diversity of designs, colors and could now create a functional master bath with clean lines and useful applications. Let’s t take a look at how this project unfolded. The team at JM Lifestyles, in New Jersey, had the task of integrating the stand-up shower, tub surround and match that with the countertop and other surfaces in the room. After templating each area, they realized that they were in need of material that could help in making this design come to life by reducing the amount of seams that would be visible. JM Lifestyles choose the Xtreme Series GFRC mix design. They began the process by creating their mold and casting surface. Incorporating a custom color blend from SureCrete with the Xtreme Series GFRC Face mix, they sprayed the cream coat on to all the surfaces. After letting that setup for about 10 minutes they followed behind the candy shell surface with the same custom color mixed in the Xtreme Series Backer mix. This material provides the structural and flexural strength to the ultra smooth, pinhole free surface of the GFRC face coat. With each piece finally casted and made, it was allowed to sit and cure. The Xtreme Series GFRC is the ideal mix design for Glass fiber reinforced concrete users, as it allows for a faster cure and demold time, in as little as 6 hours. It also delivers the ability to begin the next stage of fabrication, secondary coloring or sealing within 8-10 hours after pouring. Additional positive attributes of Xtreme GFRC is its ability to save time and labor on each project by allowing you to maximize the tables you cast on and increasing the down time between the next station or stage. The next important step was to apply the appropriate sealer. With many quality choices out there, the team at J&M Lifestyles chose ARS 400. A breakthrough in Nano-technology sealers, ARS 400 is an excellent GFRC sealer, and has the ability to penetrate and bond to the almost 11,000 PSI surface of the Xtreme GFRC. The installation of the precast GFRC panels and GFRC countertop vanity was down with multiple products. The vanity was installed with standard wall mount bracket. 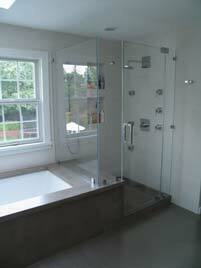 The GFRC wall panels for the tub surround were installed with acrylic mastic.